Will this fit on the SIG sauer mcx co2 rifle? A UTG 11mm to weaver mount . will this work on a Benjamin Trail NP Air Pistol. and does this turn off by it self. I wouldn't use it on anything that has recoil . will this fit Crosman R71, 6mm? Will fit directly on my Crosman Pumpmaster Classic (.177) without the "adapter". No, it would not as it is a weaver type base and that model air gun is 11mm dovetail. Will this sight fit a Benjamin Titan GP .22? 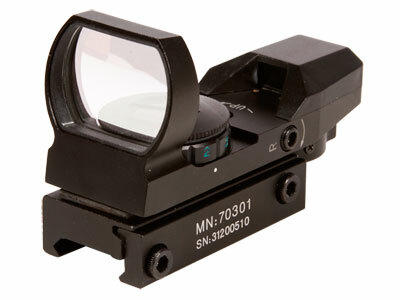 What are other open reflex sights available for the Titan GP? You will need to buy an adapter rail. I have communicated directly with centerpoint optics and this is one of two of their reflex sights they recommended for a break barrel rifle. It is machine gun rated and fully automatic tested. Only if you buy a ASG Metal Accessory Mount Base... with it.